Last time out we talked about some Gnome shell extensions that modify the appearance of the Gnome desktop. That’s not all Gnome shell extensions can be used for though, obviously. The Gnome desktop has many practical and helpful extensions that can be installed to enhance the functionality. 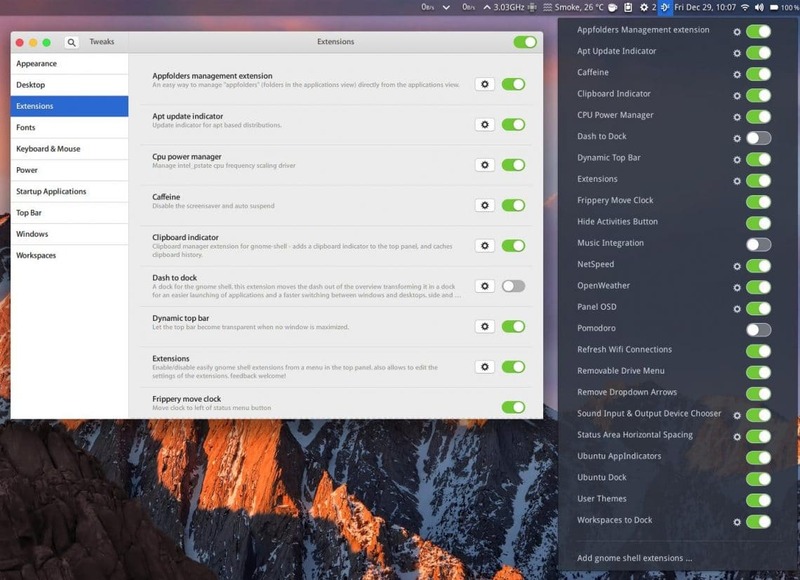 These extensions can allow you to do simple things such as checking the weather anytime with a glance at the top of your screen to managing your system and app updates. As already mentioned in previous articles, the usefulness of Gnome shell extensions is subjective. What I think is the best might not make any sense to you. Yet, I’ve tried to select the top 5 Gnome shell extensions that I think would appeal to most people, adding features that nobody would want to refuse. In case this is the first time you’re hearing about Gnome shell extensions, you can learn how to install them here. Some of you may remember this from earlier versions of Ubuntu which used Unity. Caffeine prevents your Ubuntu Gnome desktop from turning the screen off when idle. This can prove to be really useful if you don’t enjoy being locked out of your desktop everytime you decide to text while using Ubuntu. One can remove the requirement for the password after the screen is locked but that leaves your desktop vulnerable.Because these settings are hidden somewhere in the Settings, you’d probably not remember to change them when you actually leave your desktop for a while. Caffeine, on the other hand, can be easily turned on or off from the top bar. When you turn it on, the notification displayed says Auto suspend and screensaver disabled. This makes sense but can be a bit confusing to some who quickly glance through it and only notice the last word. 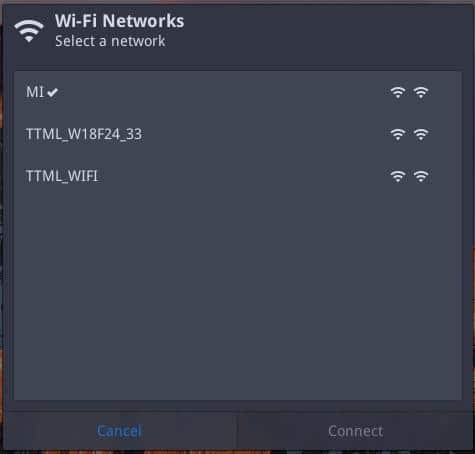 If you are particularly dependent on WiFi connection for your internet, you will soon find out that the Gnome shell does not automatically look for new WiFi connections. And it doesn’t allow you to manually do so either. 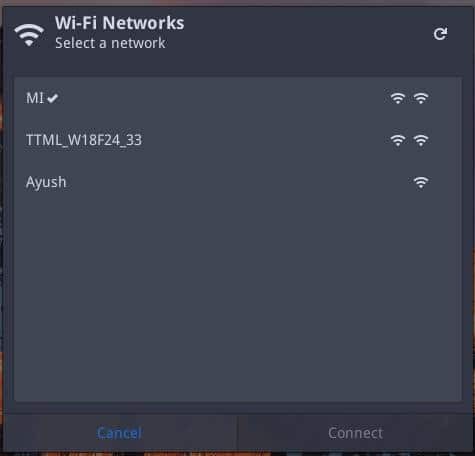 Luckily, Gnome has these extensions one of which, if the name didn’t already give it away, lets you Refresh Wi-Fi connections. You’ll notice a small reload button in the top-right corner of the Wi-Fi selection window once the extension is installed and enabled. If there’s one thing you’re going to be using the most on Linux, it is the Terminal. Even though developers have made great efforts in making things as user-friendly as possible, the Terminal is still the single-most important tool on Linux systems. Whether you want to install an icon pack or an app that’s not available on the Ubuntu software center, or fix problems, the Terminal works when everything else fails. Sure you can pin it to the dock which you can now easily access thanks to Dash to Dock. But soon enough you’d want an even faster way to launch Terminal. Wel, you can, if you simply hit the ~ key on your keyboard which is the key right above the Tab key. This brings down a Terminal shade from the top bar which you can quickly use and then dismiss using the same key. Anything you’ve entered will still be there if you were to press the ~ key again. When you install the Drop Down Terminal extension you will be asked to set the transparency and color values for the terminal shade. You can leave it at the default values. Once again, the name should be self-explanatory. 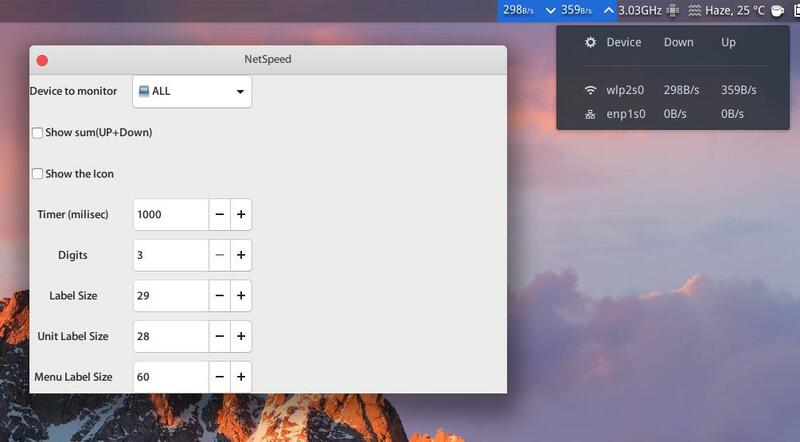 Net Speed simply displays the network speed on your Gnome top bar. There is at least one other extension that does the same thing but Net Speed is definitely the better one. Not only does it display network speeds in bytes/second (and kilobytes/second, megabytes/second and so on) by default, it also provides control over the refresh times and the size of the text and icons in the top bar etc. The other extension simply does not give you these options. 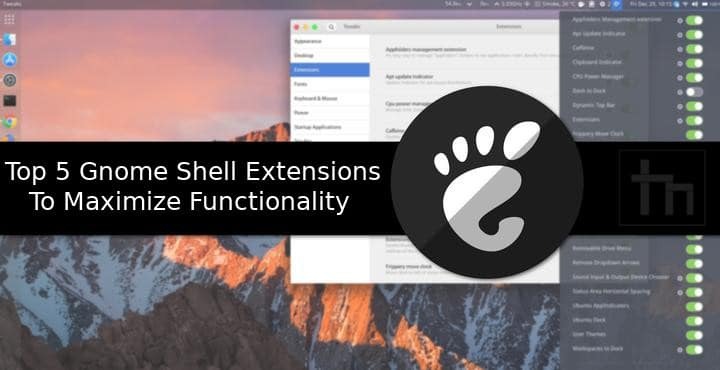 The Extensions extension allows you to quickly manage your extensions. Perhaps it could’ve been named Extensions manager. If you have the Gnome tweak tool installed you already have a GUI to manage your installed extensions. But when you can do it from anywhere without having to launch anything, why won’t you? Extensions either sit next to your other icons and extensions in the panel or in the user drop-down menu.